Individually decorated cupcakes are the perfect way to add a personal touch to celebrations. Now, with Cupcakes 'N More, you have the perfect way to serve them! The look is fresh and fun, featuring bold silver-finished wire spirals to securely hold each cupcake. 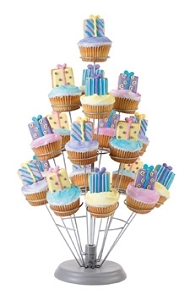 The twisting, towering design is perfect for any setting-showers, kids' birthdays, weddings, holidays and more. 18 in. high x 12 in. wide. Angled holders Give the best view of cupcake tops!